[twitter]I get up early. 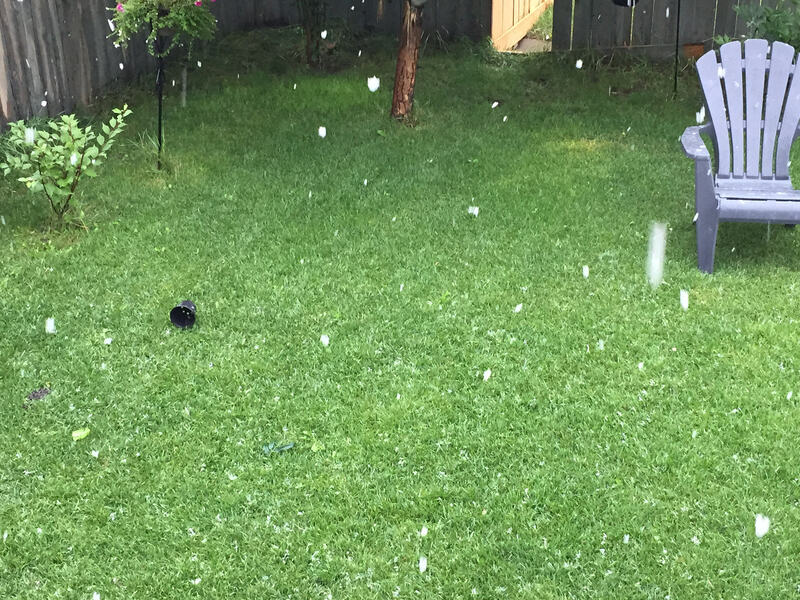 Earlier than my kids early. Even on vacation, I get up around 6, without an alarm. At home, I’ll shuffle quietly downstairs and read on the couch, or watch some tv enjoying the peace and quiet with my coffee. On vacation, when we’re all jammed in to one hotel room, my quiet early morning time is usually spent hiding in the bathroom. I’ll bring my iPhone, or Macbook, and spend an hour or more by myself on the throne waiting for everyone else to wake up. 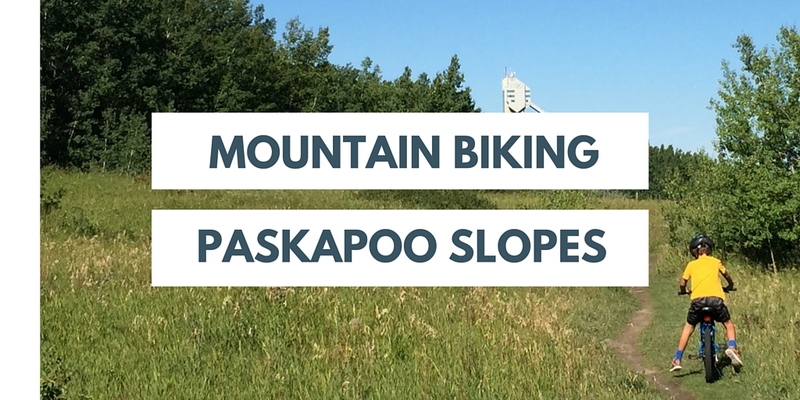 On our recent road trip to Sandpoint, Idaho, I did things differently. 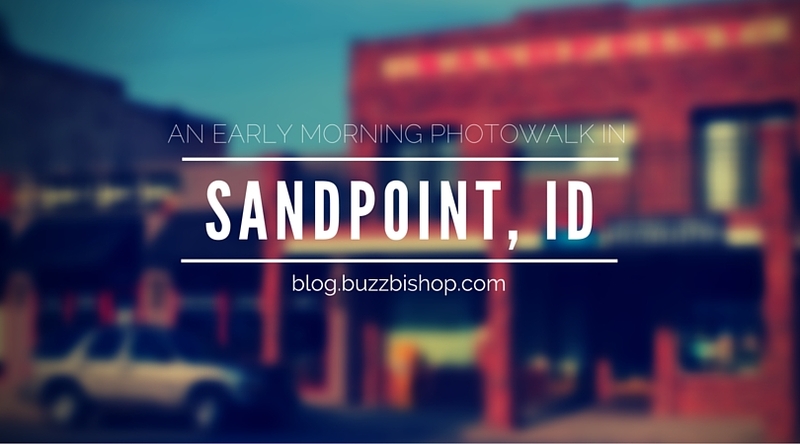 I still got up early, but this time I snuck out of the room quietly and went on a 2km walk around the outskirts if the ‘downtown’ of Sandpoint. 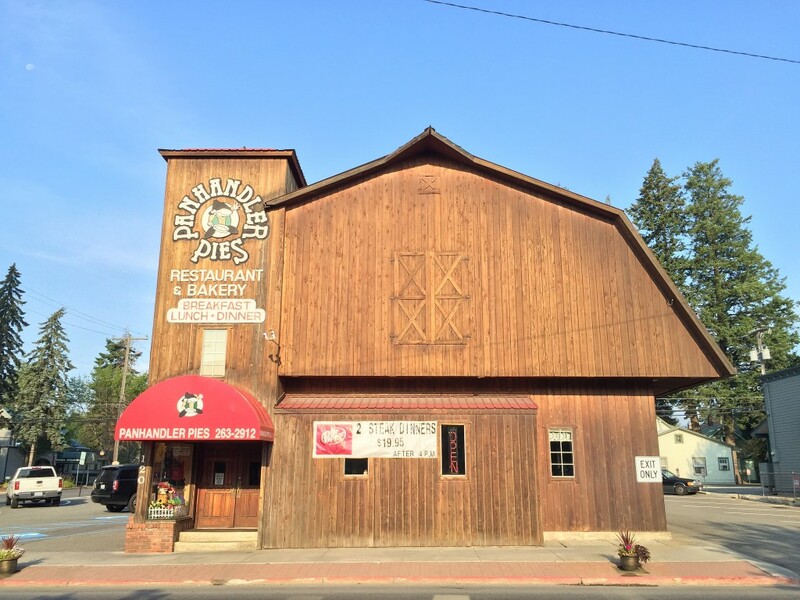 My mission was to pick up a pie from Panhandler Pies for a bbq later that day in Coeur D’Alene, along the way I discovered so much character about this resort town on the edge of Lake Pend Oreille. My walk started at the La Quinta Inn, on the NW corner of the core of Sandpoint along the old Insterstate 95. Back in 2012, the Sand Creek Byway opened, effectively creating a bypass of Sandpoint for travelers. 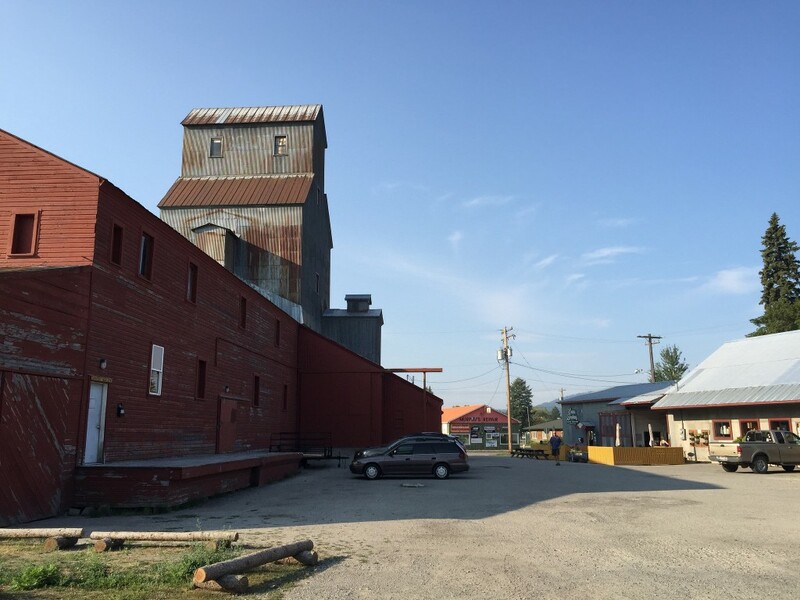 As I noticed in Wallace, Idaho, bypasses can sometimes devastate a town’s tourism. Wallace erected big signs urging people to take the historic route and stop in for a visit. 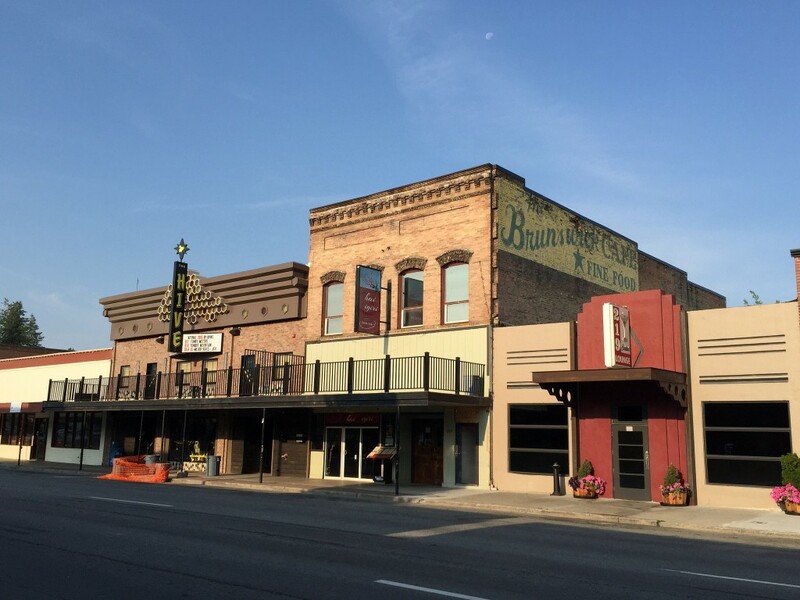 Even though the bypass of Sandpoint was also controversial, it has had an effect of quieting the town. While the traffic isn’t there for spontaneous visits to shops along the old route, people now purposely stop in the town and stay. City Beach and Lake Pend Oreille are huge magnets for Sandpoint to bring in visitors and, without the bustling highway traffic plowing through, a walkable, relaxing experience is now available for visitors. So I got up early, and went for a walk. The sign outside Connie’s Cafe is the reason I got up early for the walk. As we pulled around to park at La Quinta, I glimpsed it and it begged me to wander the town and take pictures of classic signs – much like I did in Medicine Hat. It’s the kind of kitschy old school joint I imagine spying my Mother-in-law in, nursing some classic 70s cocktail. 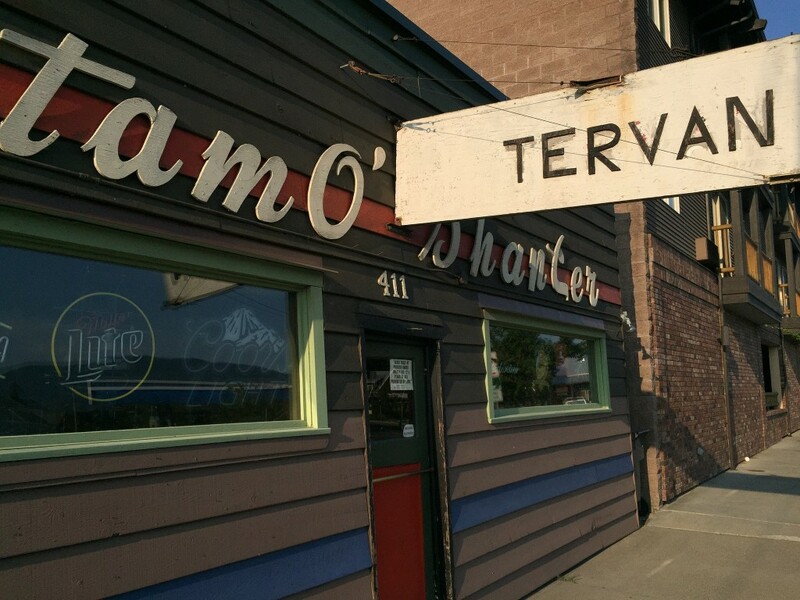 Just down from Connie’s is the Tam O’Shanter Tavern, or is that tervan? 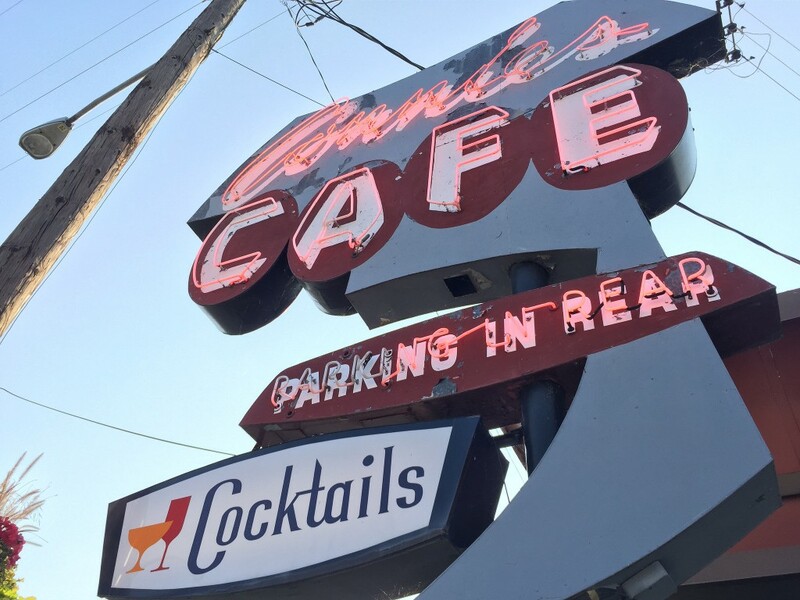 It’s been locally owned since the 30s, gets raves on Yelp for having ‘the coldest beer in the world,’ and is the kind of dive bar hipsters would love. 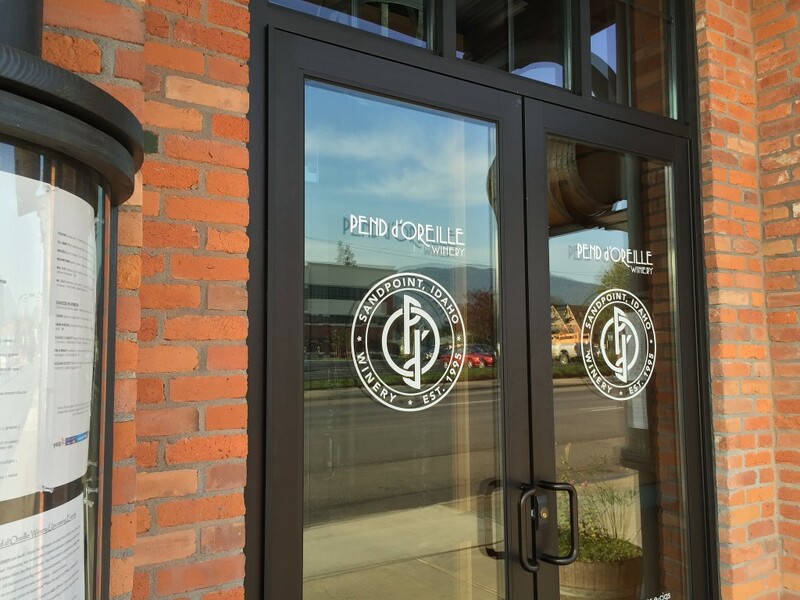 Next up on the photo walk was the Pend d’Oreille Winery a curious mix of souvenirs and gastro pub / wine bar. 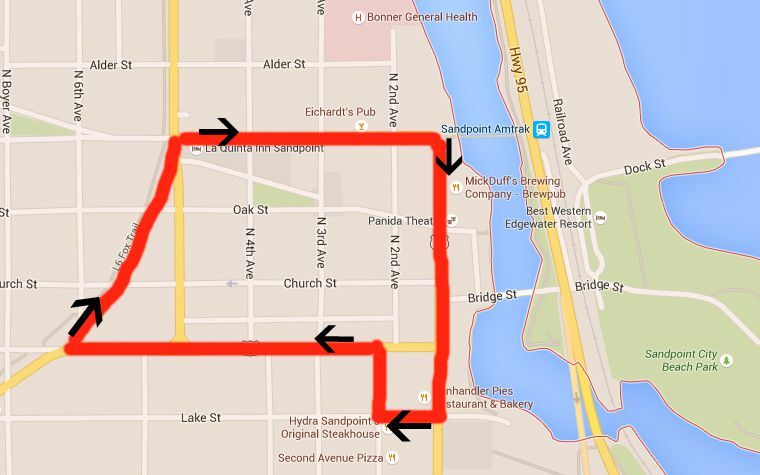 The grapes are sourced from throughout the northwest and then vinted in downtown Sandpoint. The classic Belwood Building is home for the winery. Across the street is the old home for Mick Duff’s (above). 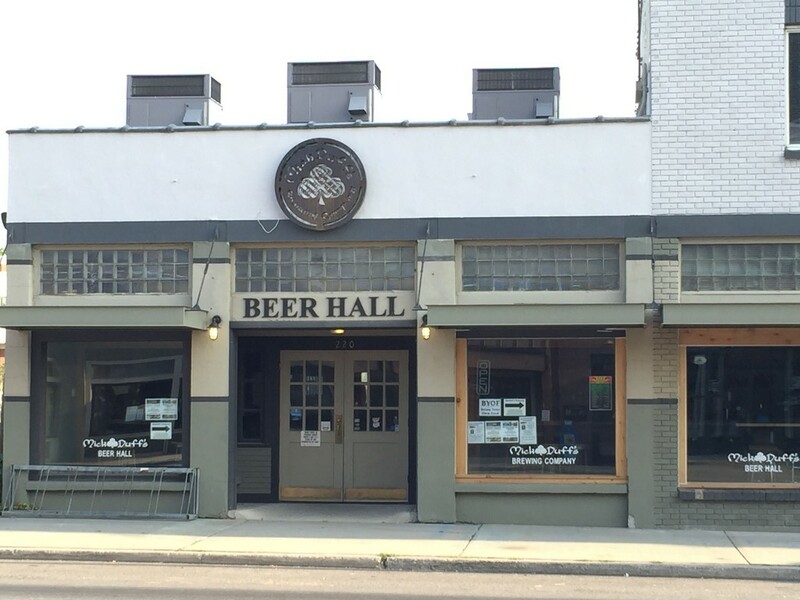 The beer hall has moved a couple of blocks down and around the corner, but the old building looks great. 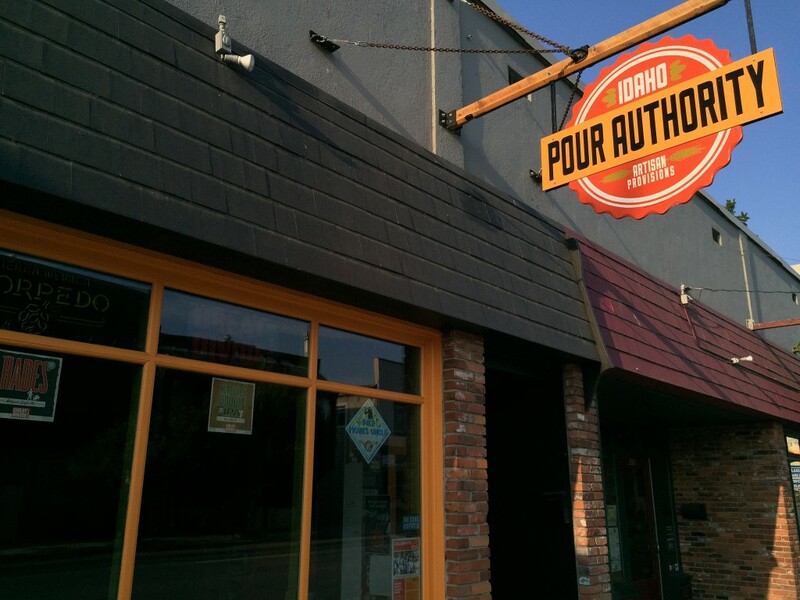 The Pour Authority (below) boasts over 300 craft brews in bottles and a rotating team of a dozen on tap. Next time. 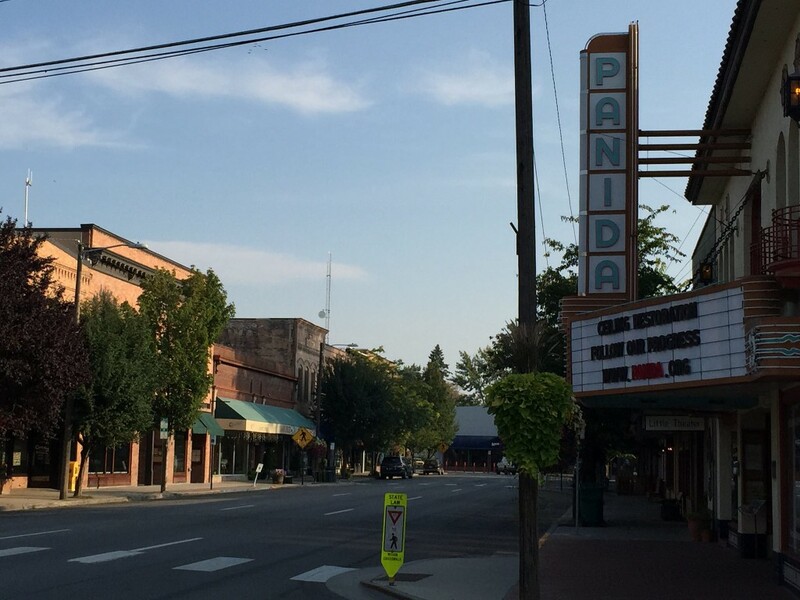 As I turned off Cedar Street and on to N 1st Ave, the Panida Theatre came into view. The theatre was built for vaudeville shows in 1927 and eventually fell into disrepair. In the mid 80s it was purchased by a community theatre group and was acting home to Viggo Mortensen back in the day. The theatre takes its name from the PAN in panhandle and IDA in Idaho, yet is pronounced to rhyme with Canada, for some weird reason. Now it also serves as a movie theatre and was undergoing renovations during our visit. 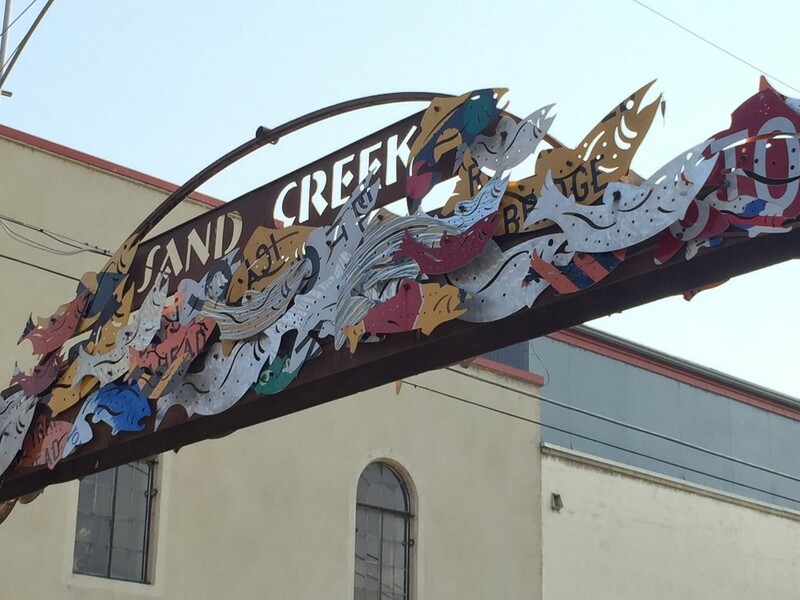 This sign of signs greeting visitors to Sand Creek called the Sand Creek Arch. 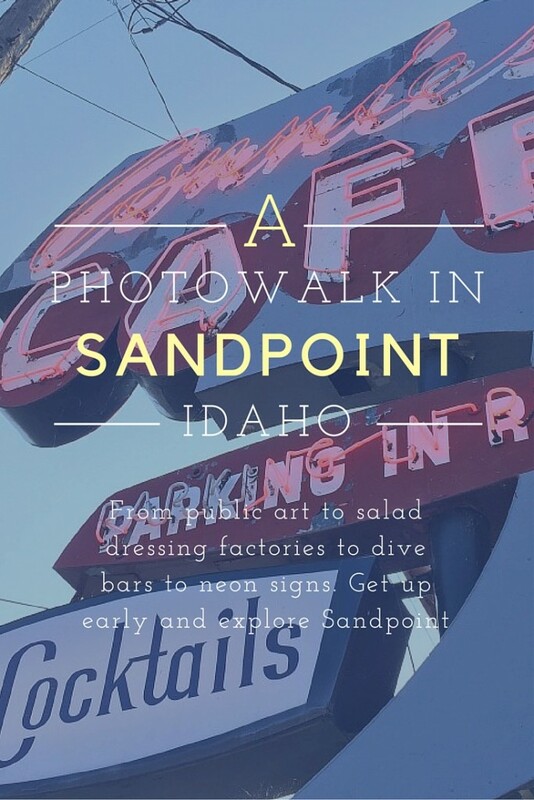 Sandpoint has a collection of artists and galleries and was looking to increase their public art experience. Local artist, Nelson Borren, received a $37 000 grant for the project that was installed in 2011. As is the case with many pieces of public art, it has been contentious with the locals. 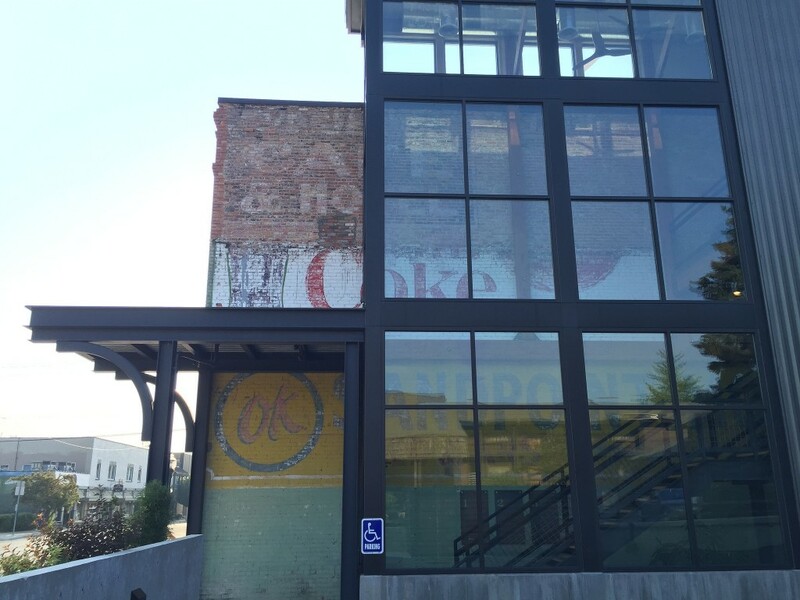 Downtown Sandpoint is filled with old brick buildings and many old signs peeking out the sides of new businesses. 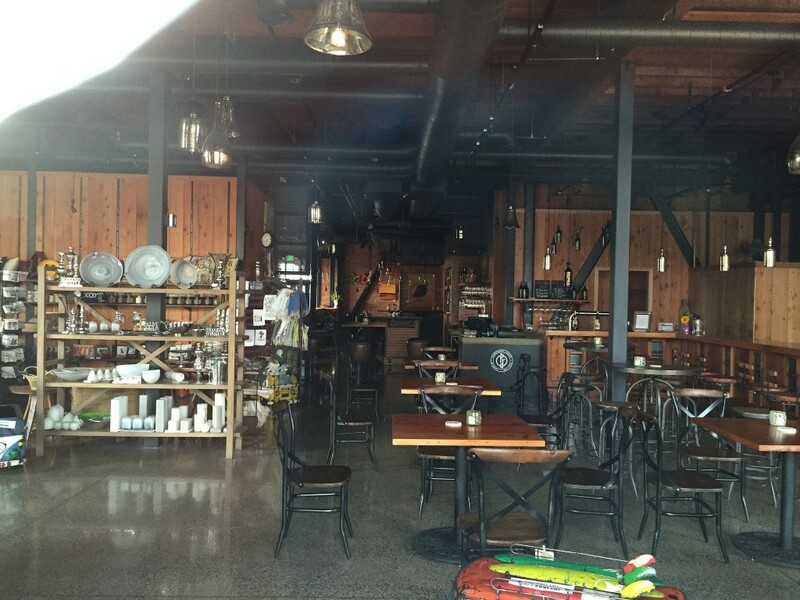 The old Brunswick Cafe building is now home to a Thai / Japanese fusion place, Thai Nigiri, and The Hive live music bar. 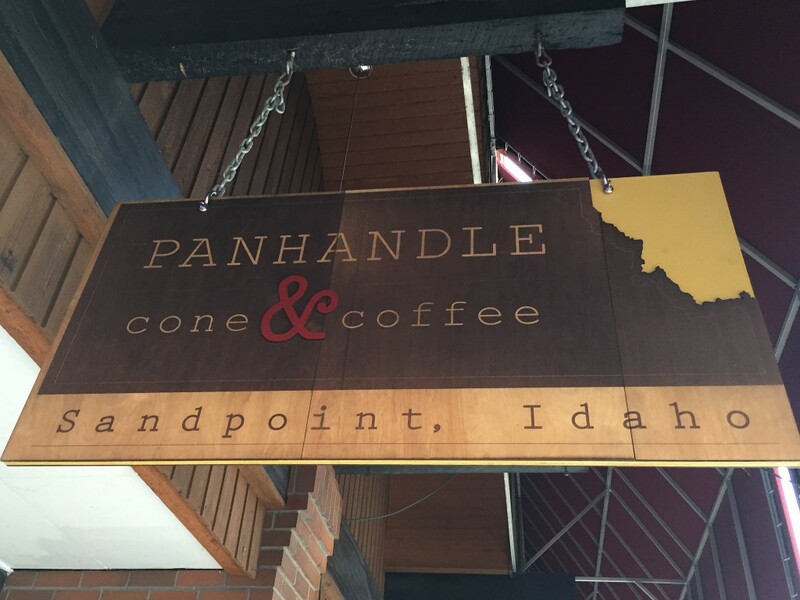 We stopped in at Panhandle Cone and Coffee the night before. Their handcrafted ice cream is absolutely wonderful. Huckleberry buttermilk ftw! 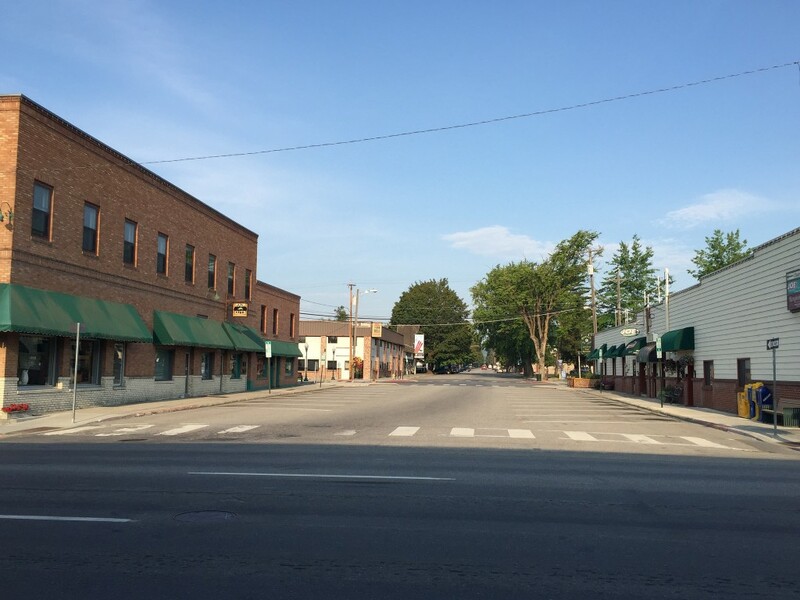 Rush hour on a Tuesday morning in July in Sandpoint. Eventually I made my way to Panhandler Pies and picked up my dessert. This is a classic old school diner. A dozen or so forest workers were gathered on a long table digging into lumberjack worthy breakfasts when I arrived. I chose a heavy dutch apple pie, and then continued on my walk. 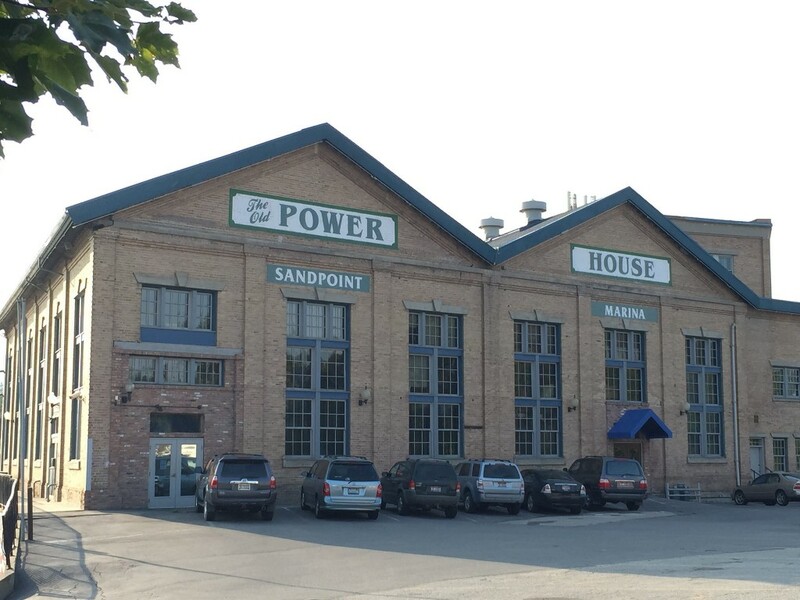 Heading back down to the water across from Panhandler Pies, I discovered the Sandpoint Powerhouse, which is now home to a marina. The plant was built in 1910 to supply electricity to the area. 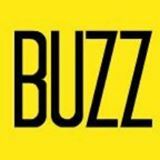 Eventually demand waned and the plant was being used as a storage facility. By 1972, it was being used to house boats and eventually became a marina home. TIL on my photowalk of Sandpoint: Litehouse Bleu Cheese Dressing has their factory in Sandpoint. It backs on to the Panhandler Pies parking lot. 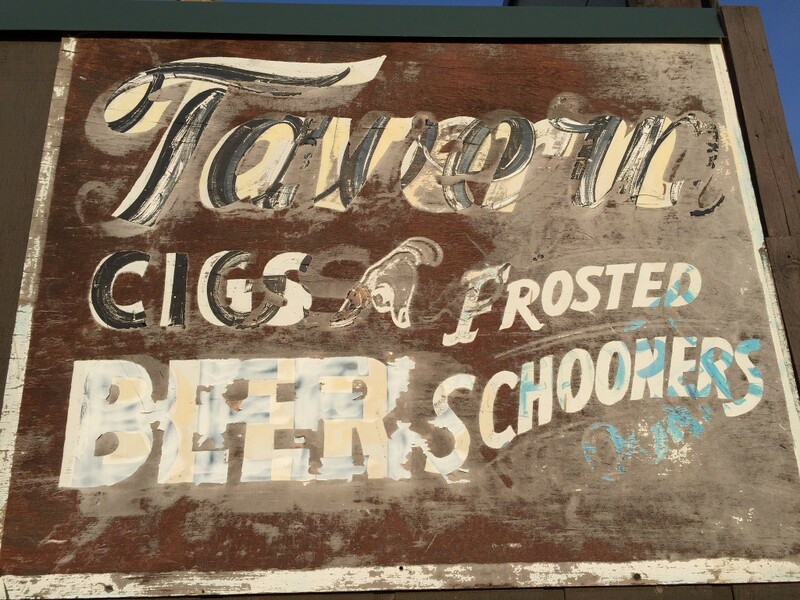 At first I thought it was just another of the old signs on a building with new residents inside, but no. 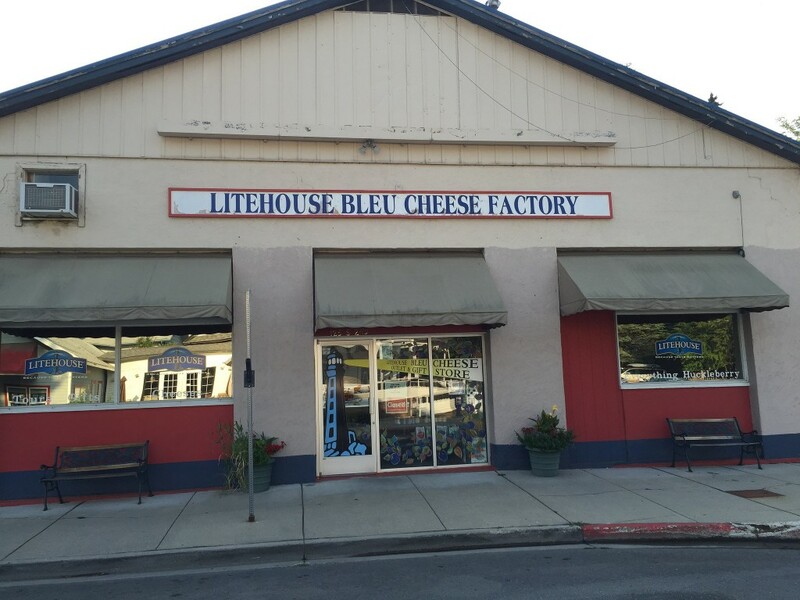 They make Litehouse Bleu Cheese Dressing in Sandpoint and have since the 60s! 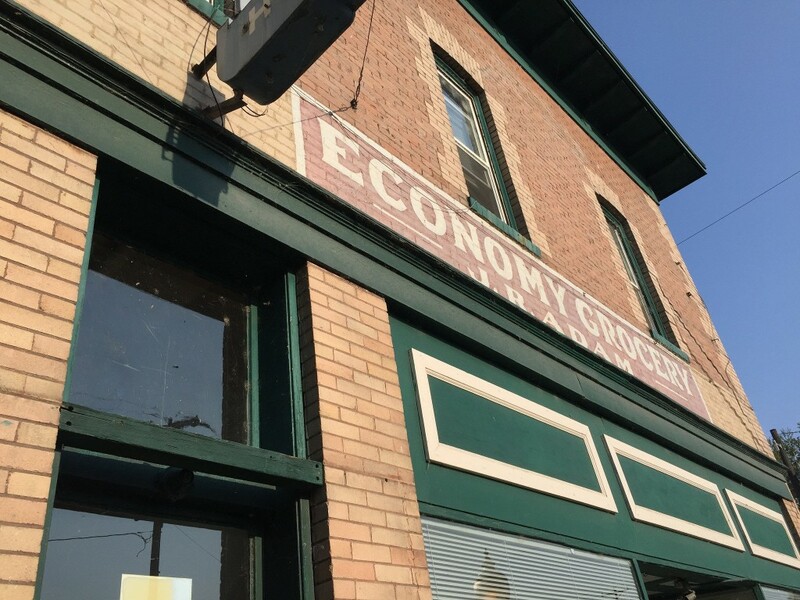 The old Economy Grocery is now the Elliott Hotel. Idaho has a no helmet law, just like Montana. It’s a classic “red state” politically. 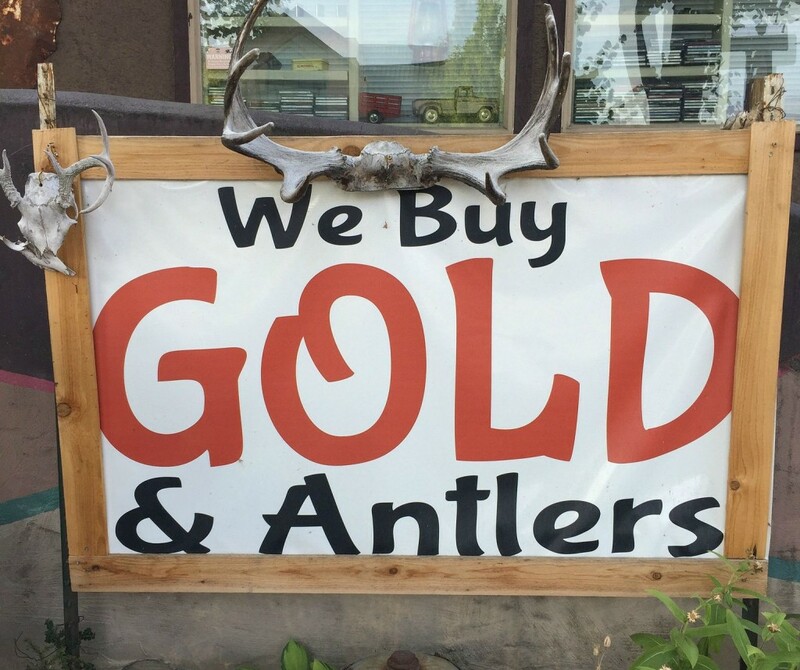 Is it any wonder then, that amongst the boutique ice cream shops, public art, and beer halls that I would find a pawn shop? No. As I was about to make my way back to the hotel, I noticed these grain elevators in the distance. I love taking pics of old ones across the prairies and thought these would make a great addition to my collection. As I walked up, I discovered 2 cool things. First was the original train track that serviced the old grain barns has now been turned in to a bike path. The Dover Sandpoint Community Trail spans 5km connecting the two towns. The other thing I discovered? 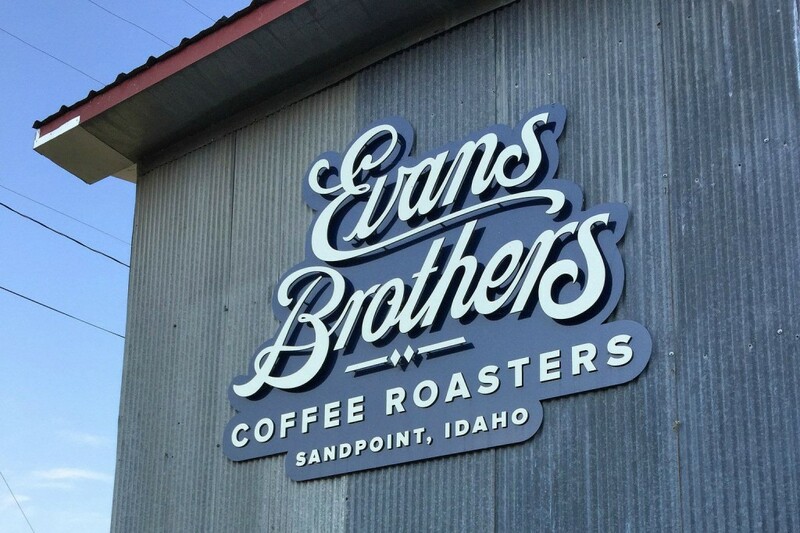 The Evans Brothers Coffee Roasters, a local coffee joint with a huge garage door entry welcoming the sunshine and early morning risers. I picked up a bag of beans, had them ground for our french press and then balanced it, along with a tall americano on the pie, and walked the remaining two blocks back to our hotel. I climbed the stairs just in time to see my wife and kids shuffling out of our room and down the breakfast bar. Instead of spending an hour hiding in the bathroom reading my phone, I’d walked a few kilometres and explored the unique history of this quiet lakeside town. I admired public art, discovered secret treasures, and took a few dozen pictures. Most people go to Sandpoint, Idaho because of City Beach or Lake Pend Oreille, but there’s so much more. 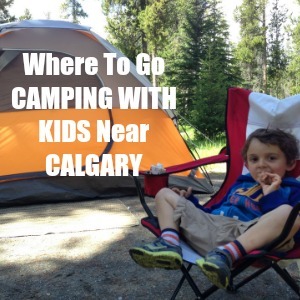 Get up early and explore it. Disclosure: Portions of our trip to Idaho were provided by Visit Idaho.